Margin or margins is a word you hear a lot in business. I want to talk about what it means and why it is important today on MBA Mondays. I did talk about margins once before, in the context of the income statement, back when we were walking through the basic financial statements. But I’d like to talk about the concept outside a strict accounting definition. I have a friend who runs a pickles business called Ricks Picks. His pickles are awesome, but I digress. If you buy a jar of Hotties (spicy sriracha-habanero pickles) from Rick, you’ll pay $7.99. That jar of pickles costs him between $4 and $5 to make and send to you. That includes buying local cucumbers from farmers, making the spicy brine, and cooking up the pickles in their industrial kitchen. That includes shipping the pickles to Rick’s warehouse and then shipping them to you. Let’s say all of that costs $4.50 per jar, then Rick’s profit on your pickle purchase is $3.49 per jar. Margin is often expressed in percentage terms, so $3.49/$7.99 is a 43.7% margin. Notice that I didn’t include the cost of Rick’s time, his office, the team in his office, the marketing efforts, the cost of his website, his accountants, and a bunch of other costs in that calculation. That is because he has to spend all of this kind of money no matter how many pickles he sells every year. Now let’s think about four different businesses that are well known in the tech business; Apple’s iPad business, Google’s search business, Amazon’s retail business, and Salesforce’s SAAS business. Each of these businesses has a different margin structure. Apple has significant costs associated with manufacturing and selling each iPad. This article in the EE Times suggests that the “bill of materials” (often called the BOM) of parts that are used to make the iPad2 are $270. You can buy an iPad2 starting at $499. If you just subtract $270 from $499, you get $222 of margin on every iPad2. I’m not trying to be accurate here. Apple’s margins on the iPad2 could be a lot higher or a lot lower than $222/iPad. 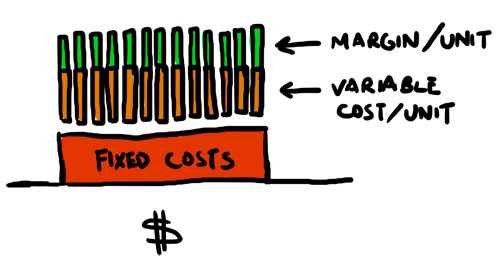 I’m just trying to point out that when you make a hardware product, your margins will be impacted by the material costs of making a physical product. Apple’s reported gross margins in its most recent quarter were 38.5%. Amazon typically operates as a traditional retailer in their core e-commerce business. This Oxo kitchen tools set costs $99.99 at Amazon. Amazon purchases that item in bulk from Oxo (or a distributor) for something less. Maybe $60 or $70 per unit. So they have a margin of $30 or $40 per unit. Amazon is not a manufacturer. Oxo is. So Amazon’s cost is the price at which the manufacturer is willing to sell it the item at wholesale. Amazon’s reported gross margins in its most recent quarter were 20%. Salesforce is a hosted software company. When you become a customer, they don’t have to make anything new to service you. They just open up additional resources on one of their servers and you are good to go. They have very high fixed costs associated with building, maintaining, servicing, and selling their software, but the cost of actually delivering an additional unit of revenue is very low. Salesforce’s reported gross margins in its most recent quarter were almost 80%. Google’s search business is a media business with aspects of the hosted software model. Providing search queries to consumers is a lot like salesforce’s hosted software business. Each additional search query doesn’t cost Google very much. They need to add more servers over time to handle more queries. The revenue those queries generate comes from the adwords paid search service. Some, but not all of that revenue comes self service. Some comes from a salesforce that goes out and sells keywords to large customers. But like the hosted software business, paid search is a high margin business. Google’s reported gross margins in its most recent quarter were 65%. Now that we’ve gone through a bunch of examples of businesses with different kinds of margins, let’s talk about why margins matter. In general higher margin businesses are easier businesses to grow and manage. Lower margin businesses are often very difficult to scale, both operationally and financially. If you think about my friend Rick, he has to go out and spend a lot of money every summer and fall when cucumbers, beans, beets, and okra are less expensive, higher quality, and fresh from the local farm, make and jar the pickles and move them into his warehouse. That is cash out the door. Then over the rest of the year, he sells the product, gradually getting back the money he laid out plus his margin. As his business grows, that summer/fall production runs costs more and more. And the dollar value of inventory in his warehouse grows. He has to come up with some way to pay for that production. This is called working capital and in lower margin businesses, working capital issues loom large and are an impediment to growth. Let’s look at a hosted software business in the mold of salesforce.com. They spend money upfront to build and host the software but then as their business scales, the cost of “manufacturing their product” is relatively low. They can grow rapidly without having to come up with huge amounts of capital to finance that growth. When you think about your business; starting it, building it, scaling it, and financing it, pay a lot of attention to your margins. Understand what kind of business you operate and where it fits in the margin universe. Understand how those margins will impact your operations and your financing needs. There is nothing worse than waking up mid-course and realizing you have a lower margin business than you thought that is more capital intensive than you thought and you are caught without a plan to deal with these issues. I’ve seen that kind of thing kill more than a few companies. Both high and low margin businesses have blessings and curses. I think you definitely described the blessings of the high margin business and the curse of the low margin business. The curse of a high margin business is that unless you have a sustainable “moat” around your business somebody can come in and reduce your margins to zero. Examples: Music Industry, Classified Ads, different software that now gets given away. The blessing of a low margin business is that as you scale you can gain efficiencies and lower cost per unit because of buying power. Its why you don’t see to many new big etailers and why small retailers say they can buy items at Walmart cheaper than they can buy them direct. This is why intellectual property is so important to drug companies. The IP is the moat. Yes and I agree with people that say why Google makes and gives away: Android, Chrome, Gmail, and Gdocs is to build a moat and scorch the earth when you try to approach the search business castle. I like to think of gross margins as the measure of the productivity of the economic engine that drives any business. If you have good gross margins then the only other thing to worry about in the short term is your overhead. I generally think of gross margin – corp OH = net margin as the shorthand for any business. It is a 3-legged stool. If you have decent gross margins, then growth is your friend as each incremental dollar of revenue creates more gross margin in absolute terms. If you can keep your corp overhead fairly fixed, then each dollar of gross margin is adding to net margins at almost 100%. Corp OH as a percentage of revenue is an important thing to watch as it tells you whether the growing business is becoming more and more efficient from a profit perspective. A healthy company has a good gross margin which is dependent upon the industry. This a measure of the health of the economic engine of the business and is the justification for pursuing growth. A healthy company has a well controlled corp overhead which declines as a percentage of gross revenue (not gross margin) as company grows. This is a measure of the efficiency of the growth dynamic. The net margin — which is simply the resultant of the gross margin and the corporate overhead — is a measure of the bottom line profitability of the company. Once you have done this analysis, you can begin to dive deeper taking a look at cost of goods sold (reduce this and you grow gross margins obviously), the LTV v CTA of a customer, the efficiency of marketing in acquiring customers and the cost of capital within the company. I very much like to analyze the productivity of persons and capital in any enterprise — corp oh as a % of gross revenue, gross revenue per employee/marketing employee. Once you see the impact of margins and how they impact everything else arithmetically, you can thoughtfully tweak things to improve performance. It is a never ending challenge and opportunity. This article was originally written by Fred Wilson on April 11, 2011 here.